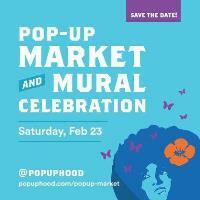 Popup Market & Mural Celebration! In an effort to engage the local community and create a feeling of inclusion for customers and community who shop at the Oakland Bay Place Whole Foods store, Whole Foods is partnering with local artists to install a mural on one of the lower parking lot walls at our Oakland Whole Foods Market Oakland store. You are invited to join us to celebrate the unveiling of the “Authentically Oakland” mural by local artist, Andre Jones, Director of Bay Area Mural Program (B.A.M.P.). This visionary image that represents the future of Oakland during Black History Month and shop curated selections of unique vendors and local makers with special guest, award-winning chef, author, restaurateur, and Top Chef Alum, Chef Tanya Holland. A community pop-up at Whole Foods Market to celebrate the unveiling of the “Authentically Oakland” mural by local artist, Andre Jones, Director of Bay Area Mural Program (B.A.M.P. ).